How i'm feeling: Feelin' well. Just soaking in all of the time I have left with her in my belly. I know I will be thrilled when she is out, but I will miss feeling her move, hiccup, and kick. Size of the baby: 18.66 inches long, 5.78 pounds estimated. Total Weight Gain: Not sure - going to doctor today. Last check, about 15 pounds. Movement: yes, she is very active. Her movements have changed since she has gotten bigger. Sleep: depends on the night - I was up for 4 hours in the middle of the night and woke up at 4:30am today. I think my body is trying to get a lil prepared. Cravings: frozen yogurt... it's the best thing ever! Symptoms: I get a little uncomfortable after a big meal, and in the evenings. But truly, nothing major! I have been having contractions for a few weeks now. +finishing her nursery!! It's complete and ready for her to come home to whenever she is. I will post pictures very soon. +hitting the 36 week mark... can't believe we are this close! +getting the diaper bag (thanks MIL), and lots of new clothes from both of her grandmas. +every week. I know she is getting really big in there, so I am just trying to enjoy feeling her move (even though it hurts sometimes) and remember it, because I know I will miss it when she is out. You look so, so great Tracy! I can only wish to look so fantastic when/if I'm pregnant! You look incredible! I can't wait to see her nursery! You look so adorable! It's amazing how quickly 40 weeks goes by. I feel like you just announced your pregnancy. Such an exciting time for you and TL! My sister just had her first baby in March, its crazy to think back to before he was here. I can't wait to see pictures of her nursery! you have to be the cutest preg-o ever!! You look wonderful....I cannot believe it is already 36 weeks, not long now!! You remind me of that pregnant lady on Pitch Perfect that they call some kind of perfect pregnancy unicorn or something. Haha. Basically you pull pregnancy off really well!! I craze froyo all the time and I'm not even pregnant! Ha!! You look so fantastic! It's getting so close, keep on cookin' little Andie! Congrats on making it to 36 weeks! you look unbelievably amazing! You look great! Can't believe she will be here so soon!! I can't wait to see her nursery! You still look so great! I can only hope that when I'm pregnant haha can't wait to see the nursery! You look amazing :) Not much time left and she'll be here !!! You look so adorable! 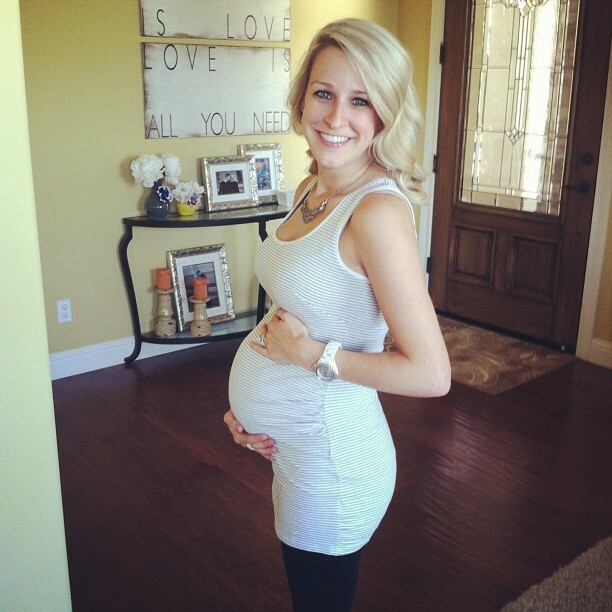 :) I can't believe you're so close to meeting your little girl! You are all belly and gorgeous! Love seeing your updates and so happy for you! You're still so tiny. It makes your tummy look fake. LOL.